Ashley Rhianne is a multi- award winning international dancer who offers tasteful, engaging and artistic services to any event or venue. Ashley is known for her expressive and personable performances that stays true to the pure Oriental style of Raks Sharqi. Ashley has performed throughout Canada, the USA, the UK, in Port-of-Spain Trinidad, Ukraine, Vietnam, Ecuador, and Cairo, Egypt. She performs at many weddings, engagement parties, corporate and social functions as well as other celebratory events. She is also a dance instructor teaching weekly classes in Vancouver, and teaches workshops both nationally and internationally. I offer many different packages and options for my clients depending on their needs. My most popular option is a 20-25 minute show that incorporates both my show and audience participation. I typically open with a veil and finger cymbal performance, followed by a sword balancing piece before getting into the audience and getting people up to dance. This section is very fun, and is always a good ice breaker! Its a fantastic way to get the party going! I then end with a drum solo before going into my finale piece. Its an action packed show! I usually incorporate South Asian, Persian, Afghani and other cultural music depending on my clients. If other additional shows are wanted, I can arrange a specialty package. I also work with other dancers and my live band which includes drummers, and an oud& fMiddle Eastern flute player. Ashley offers professional, tasteful, engaging and artistic services to any event or venue. 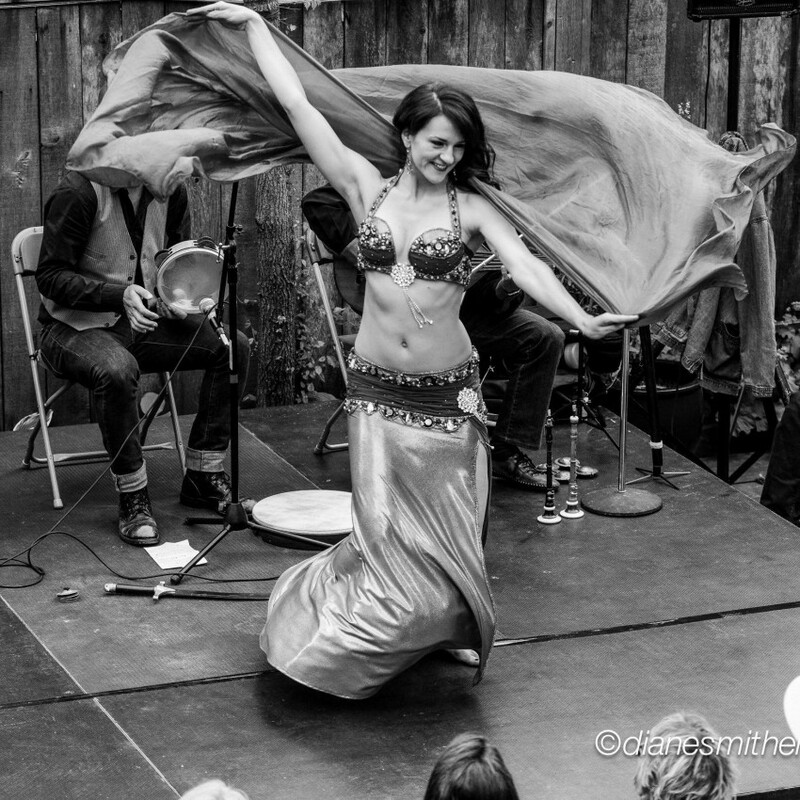 Ashley is widely known in Vancouver, BC for her expressive and personable performances that stays true to the pure Oriental style of Raks Sharqi. She is a polished dancer who loves to perform and has a natural joie de vivre. Ashley has performed throughout Canada, the USA, the UK and in Port-of-Spain, Trinindad. She has held residency at most of the Greek, Arabic, Persian and Mediterranean restaurants in Vancouver since 2000. Ashley has personally performed for celebrities such as Bif Naked, Steven Seagal and Jean Claude Van Damme. Ashley is a founding member of the longest running Vancouver-based professional Middle Eastern Dance troupe- The Harem Dancers. Ashley performs in a multitude of venues- from restaurants, clubs and lounges, to banquet halls, wedding, engagement and ladies parties to theatre and stage. In Ashley's performances, she uses veil, finger cymbals, and a sword. She also can incorporate wings, cane, candles, and fan veils. She has also trained in Middle Eastern Folkloric styles. Ashley also works with 3 Middle Eastern musicians in Vancouver, forming a dynamic Middle Eastern Dance ensemble- Samar Oriental Dance Ensemble. Ashley is also a belly dance instructor with over 12 years experience. She offers ladies & stagette belly dance instruction packages for the blushing bride to be and her female wedding party. Ashley's shows are always family-friendly, professional and engaging. She manages to get even the most stubborn person up dancing. You will not be disappointed! I need an area free of furniture, debris (such as glass, dirt) that I can dance safely in. I also use an iPod for my music, so need access to a DJ or a good quality soundsystem. I also need an area to get ready and drop my stuff. This can be discussed at the time of booking. Randa Kamel (Cairo, Egypt) is my mentor and teacher. I was honored to win 2nd place in July 2014 in Dallas, Texas at her competition. She is my absolute inspiration.